Off-camera interview shot, produced and edited by Heather Vale Goss for Toy Directory and TD Monthly at Toy Fest West 2014, South Point Convention Center, Las Vegas. Krainkn skateboards were invented to make skateboarding easier and safer for kids. They come in blue or pink versions for young kids and a bigger design for older kids. All are equipped with secure bungee cord handles that allow kids to control the movement of the skateboard without falling off. Matching helmets and pads are also available. Tags: kids, Krainkn, safety, skateboards, TD Monthly, and Toy Directory. 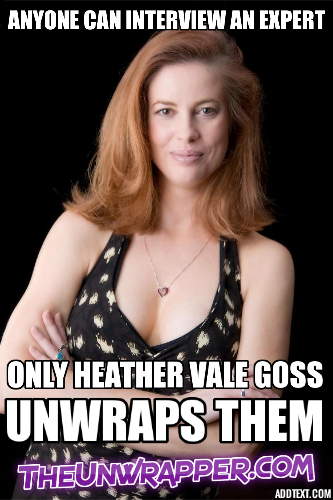 Heather Vale (Heather Vale Goss) is a writer, interviewer, journalist and show host known as The Unwrapper™. She is the premier freelance interviewer on the web and over the past 20 years has worked in all media (TV, radio, print and online). Her main beats are business, internet marketing, content creation, fine art, personal development, health and parenting -- many of which are personal passions as well. She is also a corporate, event and wedding videographer. Originally from Toronto, she is now a single mom living in Las Vegas. Heather defines "unwrapping" as peeling back the layers of the onion to discover the truth on any given topic. While many online interviewers ask surface-level questions, Heather is known for digging deeper and revealing more powerful content. Her videography work often "unwraps" an event with behind-the-scenes views. It's also fun to say that one of her guests was "Unwrapped" by her rather than just interviewed. To find out more about her services, check out her Hire Heather page. © 2019 The Unwrapper LLC All rights reserved.